Obituary for Alan Paul Dehlin | McCall Funeral Home, Inc.
Alan Paul Dehlin, 65, entered into eternal rest on Wednesday, January 16, 2019 after a brief battle with cancer. Alan was born in McCall, Idaho to Paul and Juanita (Donica) Dehlin on January 30, 1953. He lived his entire life in McCall, attended school for all 12 years at McCall-Donnelly Schools and worked at the Evergreen Forest Products sawmill in Tamarack for most of his adult life. He never married and considered his nieces and nephews "his kids". He was a wonderful mentor to all of his nieces and nephews and was a huge part of their lives. He took much joy in taking them on fishing trips and showing them how to do the things that he was so very good at. He mentored his youngest great nephew for his senior project during the final days of his illness and was so very happy that he was able to help with the project. He was a huge part of the lives of his entire family and we all felt very lucky to have him in our lives. We all loved him very much. Alan was an avid outdoorsman and an extremely talented, self-taught taxidermist. If a season was open you could always find him on a river bank fishing or in the mountains hunting game. During off-seasons he enjoyed watching the wildlife in their natural habitat and modeled his wildlife mounts after the wildlife that he observed. 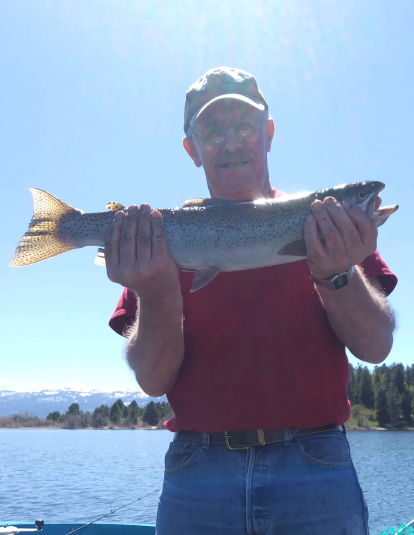 He loved the outdoors and was in his element around lakes, streams and rivers and in the mountains around McCall. He always had a faithful dog at his side and loved each of them with all his heart. Alan is survived by his sisters, Paulette Miller and Linda Branstetter, brother-in-law Ron Branstetter, all of New Meadows, nephews Cory Thompson of Boise and Eric Branstetter of New Meadows, nieces Angela Griffin (Paul) of Arizona, Lisa Eldridge (Scott) of Grangeville and Traci Branstetter (Mike) of Lewiston. He is also survived by six great nephews and three great nieces, 1 great-great nephew with two more on the way and two great-great nieces with one more on the way, and aunt, JoAnn Donica of McCall, an uncle, Art Donica of Gooding and many cherished cousins and friends. He will be greatly missed by all who knew and loved him. Preceding Alan in death were his parents, grandparents and numerous aunts, uncles and cousins. Funeral Services will be held on Saturday, January 26th, 2019 at 1:00 p.m. at The Church of Jesus Christ of Latter-day Saints, 400 Elo Rd., McCall, Idaho. Burial will follow at Bell (Spink) Cemetery. Arrangements in care of McCall Funeral Home.